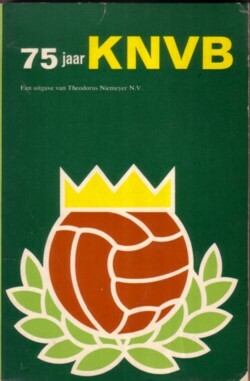 I am still trying to find information on the advertisement songs that were played in Dutch soccer stadiums in the 60’s. (See here, if you want to read a little more about this.) I know that my questions are not easy to answer, but I would love to have a complete list of all the advertisement songs ever played in a Dutch soccer stadium in the 60’s, I would love to have a CD with recordings of all these songs, I would love to know if these songs were played from records or from tapes, and finally I would love to know who produced these recordings. I have more questions, but I thought it would make a better impression when I am not over-asking. The book was published by the Theodorus Niemeyer NV in 1964. 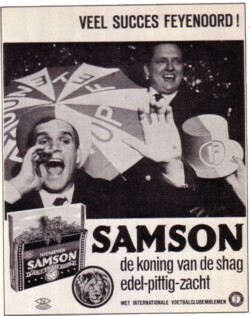 There were some soccer related ads in the book for Samson shag, one of the brands that Niemeyer NV produced in those days, but no reference to ad-songs. 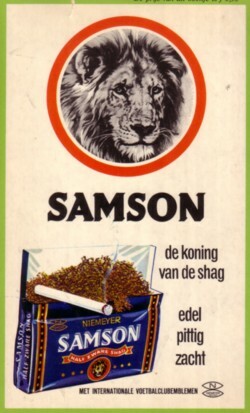 I don’t even know if there ever was a Samson jingle; i cannot remember one. Apart from the tobacco songs, I remember a song in particular that I heard in soccer stadiums in the 60’s and that, as far as I know, never was released as record. It is about ”Caraco ijs” . The song ended with the line ”Caraco ijs, geweldig lekker!” . If anybody has a longer recording of that tune (or any other sound and/or info on this topic) please let me know! If I’m not mistaken the caraco ice tune was also played as a commercial on Radio Veronica, but I’m not sure. It could have been Radio Mi Amigo as well (or even just hilversum 3, but I don’t think so). The memory does strange things. Details like this are being mixed up. Yep, real problem. I don’t trust my memories at all. And neither those of others. Memory is a fascinating subject in it self, but i often wish i had more other things to rely on. Mark Mieras – Ben ik dat?